Reminiscent of the rare 1957 6120. Rebel Rouser! Twangin’ tones abound from the G6120DSV. 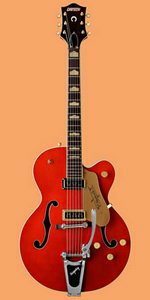 Reminiscent of the rare 1957 6120, features of these musical instruments include twin Gretsch DynaSonic single-coil pickups, Bigsby B6CB vibrato tailpiece with 1956 handle, chrome “rocking” bar bridge, and vintage hump-block fretboard markers. Finished in deep reddish/orange maple stain. ultra fine tone projection and sustain. Flagstaff Sunset.For ultra fine tone projection and sustain, the G6121 Nashville Solid Body is unbeatable. 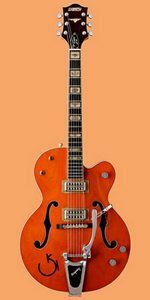 Features of these musical instruments include select mahogany chambered body, 1-piece mahogany “Action Flow” neck, twin TV Jones Classic pickups, Bigsby B3C vibrato tailpiece, and Gretsch Rocking bar bridge. Finished in mahogany stain with vintage orange top. Who do you love…. ?The G6131TDS features a semi-hollow mahogany body with a one-piece mahogany neck, rosewood fingerboard with aged hump block Alamo inlays, dual Gretsch DynaSonic single-coil pickups, Synchro-Sonic bridge, and Bigsby B3C tailpiece. The Jet Firebird is finished in gloss black with Firebird Red top. Reminiscent of the original Duo Jet of the mid 1950’s. Cat Man! Reminiscent of the original Duo Jet of the mid 1950’s, the G6128T-DSV Duo Jet features twin DynaSonic single-coil pickups, Bigsby B3CBST vibrato tailpiece with stationary handle, nickel plated Gretsch Synchro-Sonic bridge, and vintage wide-block fretboard markers. Finished in nitrocellulose lacquer mahogany stain with black top. The rarest of the rare is once again available. – Custom Cadillac Low-Rider. The rarest of the rare is once again available—the Duo Jet Cadillac Green. Features of this musical instrument include twin DynaSonic single-coil pickups, Bigsby B3G vibrato tailpiece, gold-plated Gretsch Synchro-Sonic bridge, and vintage hump block fretboard markers. Finished in mahogany stain with Cadillac Green top. If you got it, this axe can handle it! It’s Martini Time! The new G6120RHH Jim Reverend Horton Heat Heath model was designed and built to the Reverend’s demanding specifications. “If you got it, this axe can handle it!” Features include a unique combination of 1955 style Gretsch western motifs and 1958 pickups and control set-up. TV Jones Classic pickups, pinned Adjusto-matic bridge, Sperzel locking tuners, and clear Pickguard are standard equipment. Finished in vintage maple stain nitrocellulose lacquer. built to the Brian’s demanding specifications. combines classic Gretsch construction with modern performance features. Designed to conform to his own personal mods & specifications, the 2004/2005 Brian Setzer models combine classic Gretsch construction with modern performance features. Resulting in a killer set of smokin’ “Cool Cat” guitars! After reviewing Brian’s collection of vintage 6120’s, Gretsch recreated the trestle bracing to match his favorite ’59, giving the new guitars a more solid feel with added sustain. Available in either a Nashville model, or as a stripped down Hot Rod, each of these musical instruments is factory equipped with TV Jones Classic pickups (optional on Hot Rods) and comes complete with a Bigsby vibrato tailpiece, pinned Adjusto-matic bridge, and Sperzel locking tuners. Dig it!